Dear Snow: I hate you. Sincerely, Me. I live in Louisville, Kentucky! We aren't supposed to have 6 inches of snow here. Don't get me wrong, I think it's beautiful, and fun to play in (blah, blah, blah), but that's about it. Around here, we get a few inches and everything gets cancelled, which is just annoying. Okay.... the truth is that I was supposed to compete in a karaoke contest tonight. I have a costume, back up dancers, and everything! (I know... I'm awesome.) And today will be the second week in a row that it's been postponed due to the stupid snow.... I'm super sad. Don't worry, if it ever happens I will be sure to video and post it for your laughter viewing pleasure. Plus my chihuahua, Yoda, refuses to pee outside in the snow and ends up sneaking off somewhere and relieving himself in the house...ugh! Okay.... negative Nellie will shut up now. On a positive note, think I'll go curl up and watch a movie or something equally lazy. My house is still clean from last night's dinner (1 day and counting), so I'm officially off the hook and free to be lazy! I love Arbonne, so I'm giving away their "Virtual Illusion Lash Enhancer." It's a great product for your eyelashes, and since it's Arbonne, it's botanically based, never tested on animals, vegan formulated...and all that good stuff! "Magnify your eyelashes with this nourishing formula that helps transform the appearance of volume, texture, density and radiant shine in lashes. Strengthening and conditioning ingredients revitalize lashes, helping to prevent breakage and loss, and promote naturally longer, thicker-looking eyelashes." It's a $35 value. I use it and love it. It's really helped my poor little eyelashes to look longer and fuller! Blog/Twitter/Facebook it and get another entry. And hey, there aren't many of you, so chances are great! I'm sure I'm supposed to wait until I have like 100 followers to do a giveaway, but I'm impatient and wanted to join in the fun. So your odds are good! Okay... I'm gonna go be lazy now and sulk about the snow. 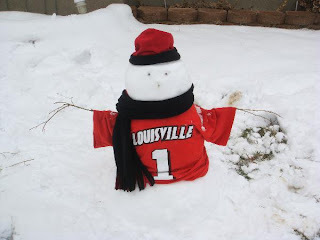 I like the Louisville snowman! He's looks happy that his team beat Syracuse yesterday. :) Sorry to hear the karaoke is postponed again. That is so disappointing! Arbonne is fantastic!!! Love it!!! Silly puppy... refusing to go potty in the snow, that would make me very upset! I'm with you I love snow, but not when I have something i've been dying to do! I am totally jealous your karaoke night sounded amazing!!! I can't wait until you are able to do it so we can see!! What an awesome giveaway! I am a new follower and am always looking for something to help out my eyelashes. Oooh, oooh, oooh! Pick me! Pick me! I'm already a follower AND I only have six eyelashes per eye so I really, really, REALLY need this product! This is an awesome giveaway!!!!!!!!!!!!!!!!!!!!!!!!!!!!!!!!!!!!!! Holy smokes. Ok, I have calmed down. I am following you but I clicked to follow you before I found out about this giveaway because you blog is awesome and I am not kissing up! I tweeted too, can you tell that I want to win? You do not have to have any number of followers to do giveaways...if you do them and then get more followers to get the word out you will build your follower base! I follow you! Great giveaway. I'm following you now! Cool giveaway! I just tweeted it to! Snow - I'm jealous! I miss my years in Ohio and the great snowstorms! I've seen one, count it, ONE mini-flurry since living in Texas. Never heard of Arbonne, but it sounds neat! I follow your blog now!! Thank you for the giveaway! Fun! I tweeted about your giveaway! Thanks! I follow!! Thanks for the chance! Come and visit me aswell! fun! I live in Nashville, and totally feel you about the smallest amount of snow shutting down the city. I hope its over now! Hi! I follow your blog! Thanks! I'm a redhead, so my eyelashes are almost BLONDE--not the sassiest color! This would be so great for me! This sounds great. Mascara is the only thing in my makeup bag you can count to get on my face everyday. Even lip gloss is questionable. So, I would love to try it! Thanks for hosting this awesome giveaway Ashley!